Spring ephemerals are a sublime gift of nature at the end of a long cold winter. 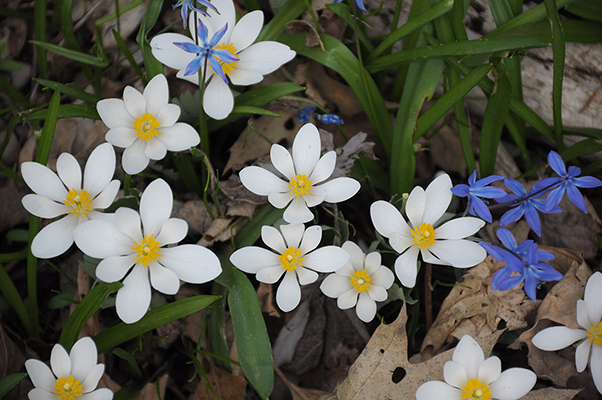 These early woodland wildflowers occupy a short yet glorious interval in the woodland, blooming and setting seed during a small window of time between snowmelt and when the trees leaf-out. Their brief presence in the woodland is connected to the lives of numerous other members of a community, all participating in beneficial exchanges at a critical intersection in their lives. Woodland plants grow among the rich humousy soil created by leaf litter. This leafy environment is also home to myriad insects that interact with the spring ephemerals. Seeds of Bloodroot, with elaiosome. The seeds of some ephemeral species, such a Bloodroot, are dispersed by ants. Bloodroot seeds have external appendages called elaiosomes, which are made up of a nutritious fatty substance that attracts ants. The ants carry the seed back to their nest where the elaiosome is eaten by their young, and the seed then discarded. The seeds are undamaged by this process and germination of the seed is enabled by the fertile environment within the nest. Seed dispersal by ants is local and takes place within only a few meters of the parent plants (unlike seeds dispersed by birds or wind). Plants that depend on this seed dispersal process are susceptible to habitat fragmentation, which inhibits the spread of spring ephemerals. Once these plants disappear from a woodland they rarely return. Other ephemeral seeds are carried farther away from the parent plants. 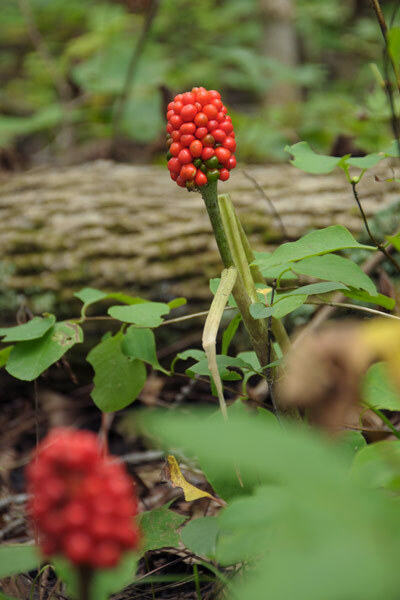 The fruits of Jack-in-the-pulpit are eaten and dispersed by various small mammals and birds. 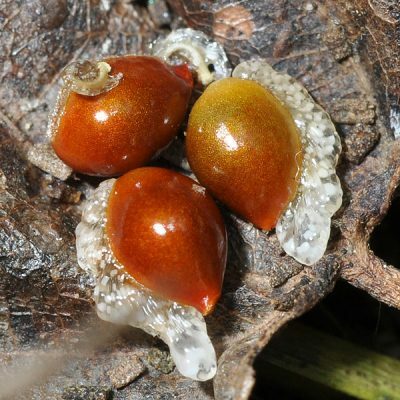 In the case of Mayapples, box turtles are important distributors of the seed. The first to bloom in spring, ephemeral flowers are a critical source of nectar and pollen for bumblebees, mining bees (andrena bees), various flies and gnats. An abundance of these early blooms helps to lay the foundation for healthy bumble bee numbers all season long. 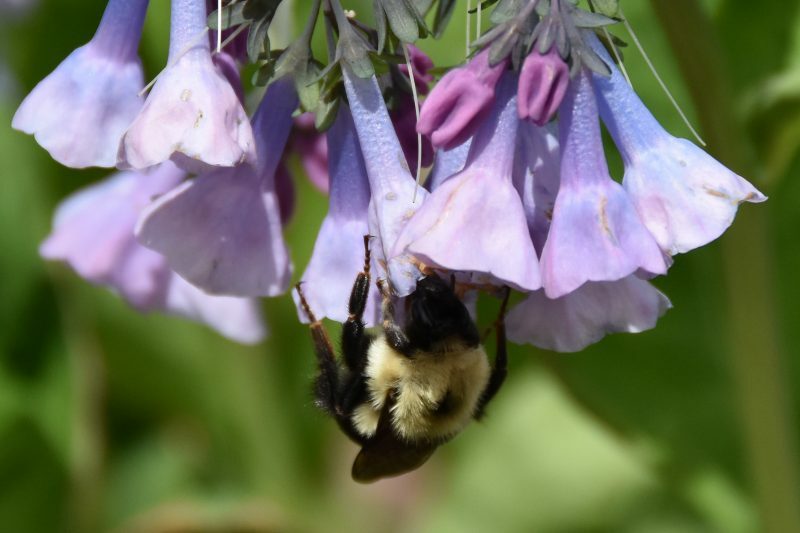 Unlike bumble bees, which can feed from a wide range of flowers, many early pollinators are picky eaters that collect nectar and pollen only from one group of closely related plants. Numerous mining bee species are specialists, and are out foraging strictly for their partner plants, such as Trout Lily and Bellwort. 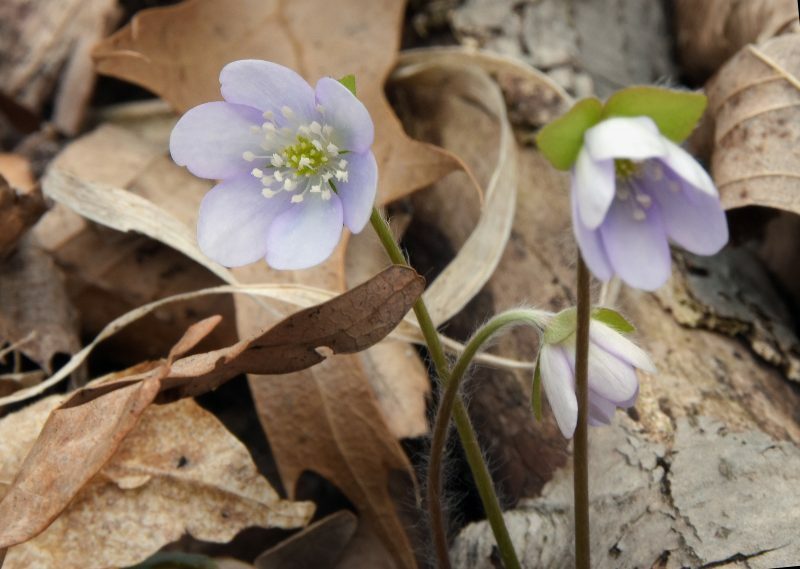 Since the competition for nectar and pollen isn’t quite as intense in the early spring, some wildflower species such as Bloodroot and Hepatica don’t bother producing any nectar at all. 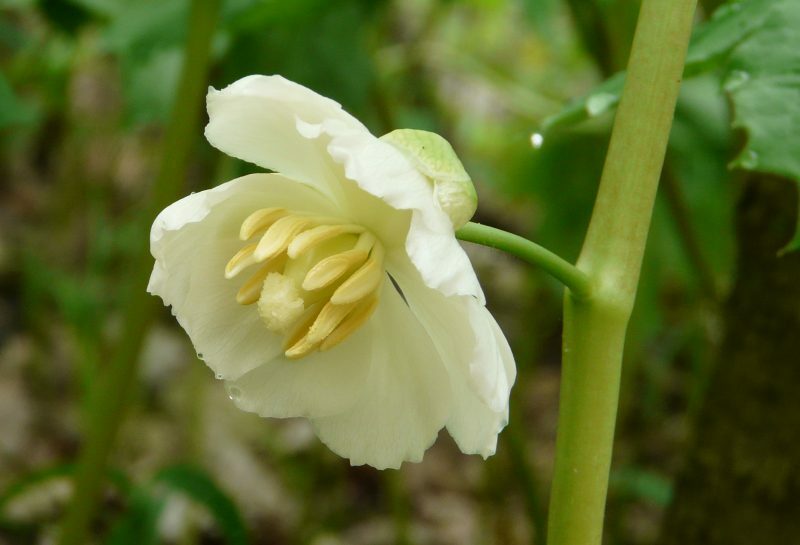 Mayapple flowers compensate for a lack of nectar by offering a very generous pollen reward. Pollen is an essential source of protein that bees use to feed their young, so even without nectar, bees will avail themselves of the pollen. Bloodroot unfurls in the warmth of the sun for a short period of time, and the stamens start releasing pollen within a few hours of opening. The petals drop quickly once pollination has occurred. Sharp Lobed Hepatica (Hepatica acutiloba) produces only pollen. 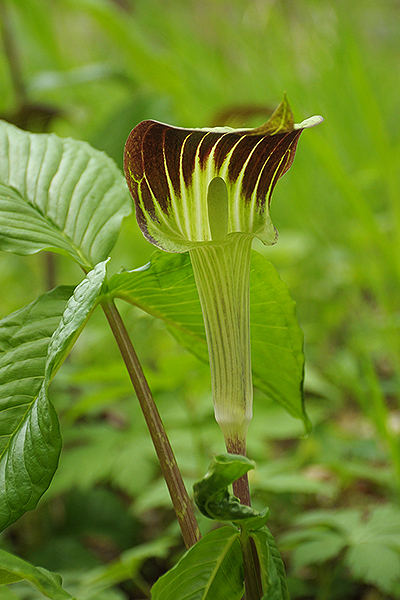 Another “pollen only” producer, Jack in the Pulpit is a dioicious species. Which means that each plant bears one or the other, male or female, flower parts. These unique looking ephemerals are pollinated by fungus gnats, which are attracted into the “pulpit” by a slight fungal odor. The unsuspecting gnats lay their eggs on what they believe to be a fungus. When they are finished laying eggs the gnats are unable to crawl out of the plant because of the slippery interior. However, if the plant is a male, they can exit through a small opening at the base of the chamber. By the time they finally exit the plant they’ve been dusted with pollen from the male flowers. The gnats eventually enter a female plant, where the accidentally gathered pollen brushes off on the stigmas and pollinates the female plant. The bright red berries that appear in later summer are the result of a pollinated female plant. More about gardening with spring ephemerals….